The children of the world have been playing with some form of toy or another since the dawn of time. Kids are quite capable of sitting down and enjoying whatever adults put in front of them, their imaginations taking off with the tools at hand and making the most of anything, from a block of wood to a complex electronic game. The 20th century has seen the growth and advancement of just about everything we use on a daily basis. Motors, batteries, computers, and chemicals have made modern life possible and along the way toys have enjoyed something of their own evolution. If you trace the changes in children's play you can more or less trace the overall changes in the technology of the day. They often lead the charge, bringing new features to the populace in an affordable package early. 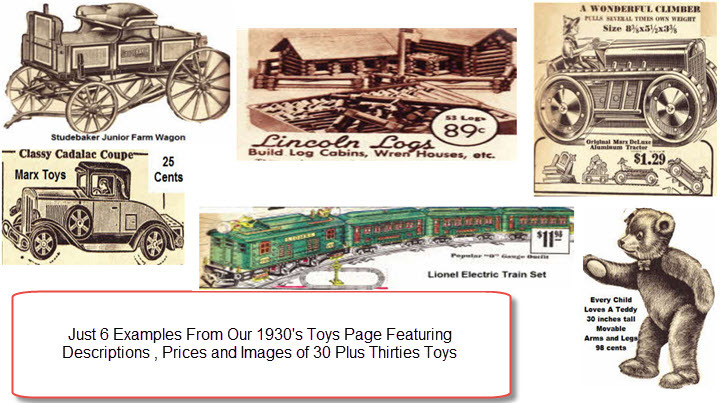 The first twenty years of the 20th century saw the introduction of the Teddy Bear, the Raggedy Ann Doll, and Crayola Crayons, merely advancements of existing popular toys, dolls and drawing materials. Parents who had grown up in the waning years of the 19th century still handed down handmade dolls and wood toys to their children, so companies merely thought of exciting new ways to present them. In the 1920s, it was more of the same. However, something else happened midway through that prosperous decade. Technology and Pop Culture exploded beyond the scope of anything anyone else had ever seen, making it possible for everyone in the country to listen to the same show on the radio or watch the same stars in film, or drive the same vehicle down the road. The toys reflected the boom. Die cast metal cars and the first mass produced airplanes and cars for young boys were spreading rapidly, while the Raggedy Ann doll was introduced in 1918 and became immensely popular before being surpassed by Madame Alexander dolls in 1929. 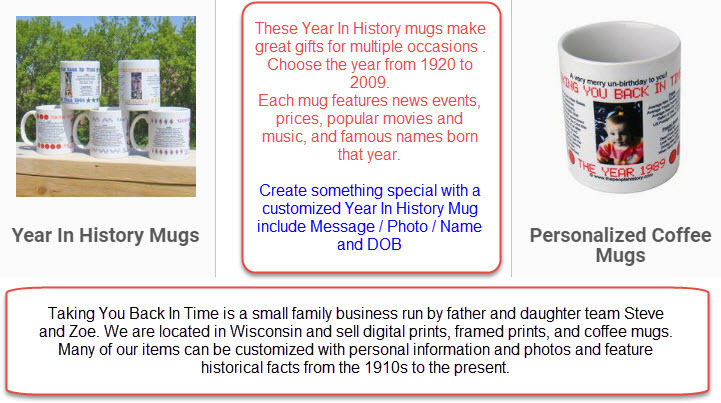 That's not to forget the novelty items that seem to stick around longer than anything else, such as the Yo-yo, also introduced in 1929, and mini-golf which first struck the tiny green lawns behind shopping structures in 1926. The 1930s was the inverse of the 1920s in terms of prosperity. With the onset of the depression, a lot of the ingenuity of the past couple of decades in toy design was sidelined, if only because so few children could afford to own something new and expensive. 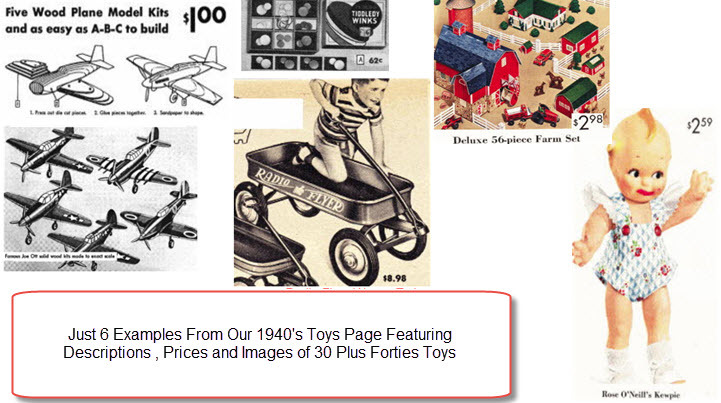 But, dozens of toys and games that we still consider amazingly fun by today's standards were developed in the 1930s. Forbes Magazine named the 3-D view master as the biggest toy of the decade, showing once again how technology was so influential in wowing children in any decade to a new toy. Likewise, pop culture tie-ins finally found the grip they needed to boast new ideas and mass marketed options. The Golden Age of Comic Books exploded in 1938 with the introduction of Action Comics and Superman and tie-ins were soon to follow, along with the bucket loads of x-ray glasses, and hand held radios sold on the back pages of early comic books. 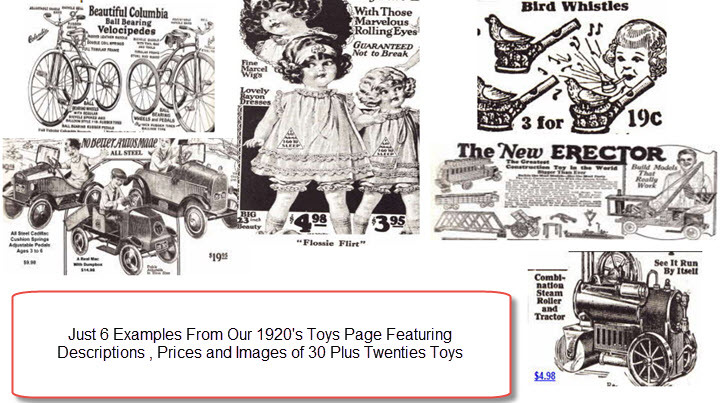 Some might say the 1930s were the beginning of cheap, easily broken toys for that very reason (and for their inexpensive price point). The first movie character ever made into a doll was Scarlett O'Hara in 1939, by Madame Alexander. One of century's best selling and most lasting legacies though started in the 1930s though with board games. Monopoly, Sorry, and Scrabble were all invented in the 1930s. While Scrabble took a few decades to get an audience, Monopoly was an immediate success and has been one of the best selling board games in America ever since. With the onset of another World War and the heavy lift in factory output and the boom in Hollywood, just about everything in the world was starting to specialize a little bit more. Toy production was no different. Especially after the monumental success of products marketed specifically to children in the last couple decades. 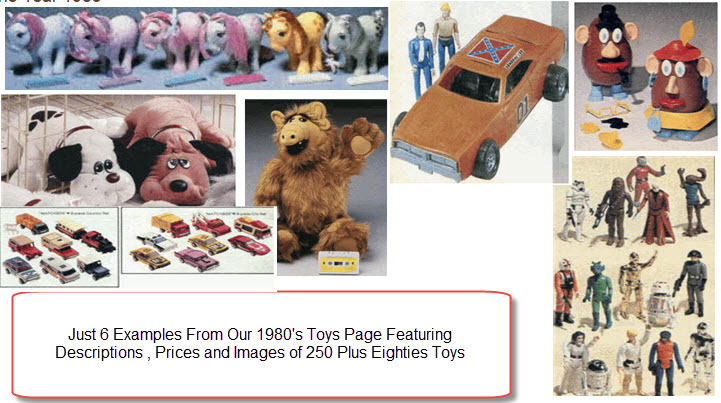 The idea that making a line of toys en masse for children (of which there were many) was profitable started to sink in and they reflected that. The 1940s saw yet more board games; this time around it was Candy Land and Chutes and Ladders, specially designed for children to play and enjoy (a departure from the economically minded Monopoly) and yet more games for the whole family such as Clue. There were plenty of new ideas on the market for those simply seeking out, simple inexpensive fun. The small toys market was just as big as ever, with the invention of Silly Putty (Silly Putty like many great inventions was an accident when a General Electric Engineer was trying to create synthetic rubber, but ended up with a strange substance that bounced and stretched, no use in engineering but great for kids to play with, so started Silly Putty). Big machinery found a market in the building boom and New Deal era of a pre-war and wartime America and Tonka Trucks made their first appearance. Young boys could play with miniature versions of those great yellow monsters their fathers drove every day on the job. Real life imitation was reaching a new spike in the toy market. The 50s however, saw the spark the market was truly looking for - that of TV. Television advertising was a relatively new endeavor. It was pricey and mostly relegated to cigarette and cleaning ads, targeted to the audiences that could afford and actually watch TV. But as television grew in popularity and more homes purchased one, the programming expanded to include children and family style shows. Enter Mr. Potato Head, the first toy ever advertised on Television, and released in 1952. It made four million dollars in the first year (by today's standards, that's over $30 billion). Not only had Hasbro put their full manufacturing might behind production, they had marketed liberally and subsequently created one of the most popular of all time because of it. The Hula Hoop The Hula Hoop started in Australia as an exercise ring (made of Bamboo), a small American company Wham-O saw the hoop and made it in plastic and introduced it in 1958 renamed it the Hula-Hoop and it became an instant success with children and parents making it popular in that year. Other companies followed suit. While novelty items (which tend to find an audience beyond children, and millions of uses of their own) such as Frisbees and Ant Farms were developed as well in 1957 and 1956 respectively, it was the Barbie Doll, next to Potato Head that has probably maintained the largest following since then. First released in 1959, Barbie Dolls only grew over the years. Innovation struck hard in the 1960s and toys started to express that, with the inclusion of electricity and much more complex parts. The Easy Bake Oven was released in 1963 as an extension of the 1950s "homebody" image so often illustrated on TV for young girls. In the realm of board games, ingenuity continued to develop and games like Operation arrived, utilizing a simple electric board concept to buzz a losing player for missing their goal. Etch-a-sketch made its first appearance in 1960 and the simple, yet party style addictive Twister was introduced in 1966. Of course, the 1960s were incredibly explosive, politically and socially and while children's play don't often reflect these changes, GI Joe, first released in 1964 is considered one of the biggest of the decade. The simple doll formula that had been successful in every decade before it was turned to the military and the imaginations of young boys. The result was a toy which found great success after decades of military operation and going into the Vietnam era. In the 70s, the Rubik's Cube (The Rubik's Cube was originally designed by a Hungarian Mathematician as an aid for teach math concepts to his students) hit big with a complicated, confusing formula that both confused and captivated children and adults alike. Along with the development of diverse, all ages friendly like the Rubik's cube was the skateboard. Girls loved the Barbie dolls which still are popular today and each year added extra accessories including cars, fashion clothes and much more. Released in 1975, the skateboard was a simple concept developed almost as a novelty that only took a short while to boom into the sport that we all recognize today. By the 1980s, the skateboard was equal parts children's play thing and adult sport opportunity. 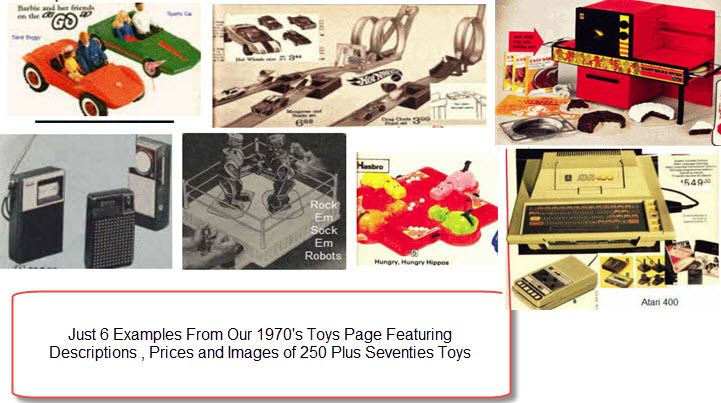 The 1970s saw the development of a half dozen other popular ideas for adults and kids alike, such as the at home robotics kits and early electronic games such as Pong that started making the rounds. 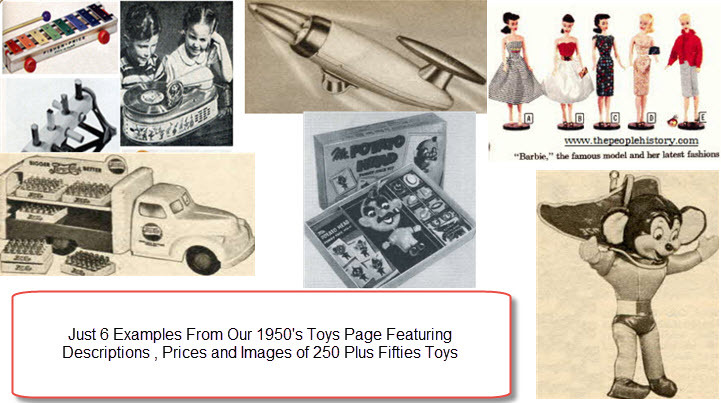 The idea that a childs play thing could cost so much was still foreign to many parents and so dolls such as Crissy and Velvet were largely popular, alongside matchbox cars and slot car racer kits. The play things for children of the day were equal parts new technology and classic nostalgic flare. The 80s had a very distinct personality to its pop culture phenomena. It was in the 80s that we saw the first mass explosion of hysteria for new playthings, with the 1983 winter shortage of Cabbage Patch Dolls. One of the biggest pop culture crazes of its times, the individually named and crafted Cabbage Patch Dolls join the ranks of the dolls of each decade, reflecting the eternal power of the doll. Trivial Pursuit, a response to a few decades of mass information and the development of world wide pop culture, also appeared in 1983 and remains today as an after dinner favorite to show off all that Jeopardy worthy information you keep locked away. Flash forward a few years, and the electronic age kicks into gear with the introduction of hundreds of new kids play ideas that could talk, move about and imitate favorite cartoon characters. The Teenage Mutant Ninja Turtles hit it big at the end of the decade, unleashing a blitzkrieg of marketing on the nation, and other 80s favorites followed with shows like Transformers or He-Man. The "action figure" craze started by GI Joe in the 60s exploded. Soon, Nintendo kicked off the home video game console era (after a failed start by Atari) and childrns gifts were not only complex, but incredibly expensive. 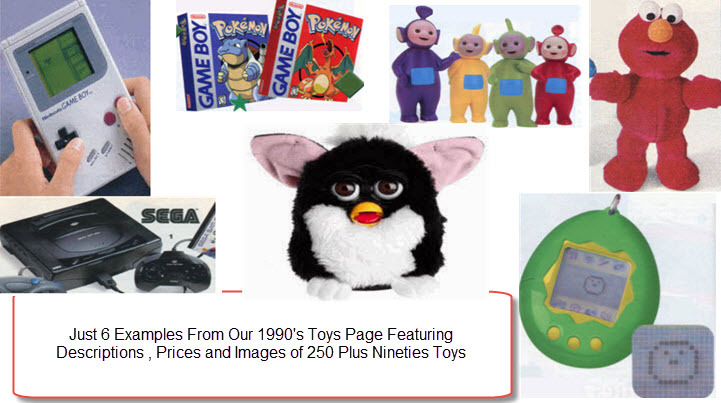 The 1990s saw the culmination of so many years of marketing, cross campaigning and the development of new technologies, in that hundreds hit the market each and every year, and almost every year saw a "must have" toy, thanks to TV marketing and mass shortages, similar to the Cabbage Patch Kid rush in the 80s. Roller blades saw a particularly heavy rush in the early 90s after their creation in 1990. Similar to skateboards, roller blades found mass appeal very quickly, growing beyond the bounds of simple children's fun. Beanie Babies were such an incredible craze that the prospect of children owning them soon died away because of the prices they garnered, induced by their rarity and mass demand. Tickle Me Elmo hit the kinds of epic mass appeal for children that Cabbage Patch Kids did before it, selling out weeks before Christmas, and today the descendants of Elmo are still alive and kicking (and still hard to find). With a turnaround time of about 5 years on new video gaming technology, two generations of advancing games saw their time in the 90s, along with portable gaming in Nintendo's Gameboy (which sold millions of units).